Admiral of the Royal Navy Fleet, Honourable Robert Digby, was born on December 20, 1732, the third son of Hon Edward Digby and his wife Charlotte Fox. He was of the noble house of Digby, an Irish peerage dating form 1620, which became a peerage of the United Kingdom in 1765. Of the six boys in the family, Edward and Henry became 6th and 7th Lords Digby, respectively. However, Edward’s sudden death in 1757 left Henry the title and estates. Another brother, William, was Dean of Durham. His brother Stephen went into the army before pursuing a career at the court of George III, and the youngest brother, Charles, would grow up to become a Somerset parson. For a short time after his brother Edward’s death in 1757 Robert took over his seat as MP for Wells. As a younger son, Robert had to make his own way in the world, and so he entered the Naval Service as a young boy of twelve or thirteen. Reasons for choosing a naval career are not clear, as there was no naval tradition in the family at this time. Nevertheless, Robert flourished and became Captain of the frigate “Solebay” in 1755, when he was only twenty-three years of age. The following year, Admiral Digby was posted to the “Dunkirk,” a 60-gun ship, and in 1788 he was promoted to the 74-gun “Ramillies” and patrolled home waters in Palliser’s division. The following year, Robert was appointed one of the two Rear Admirals in Admiral George Rodney’s fleet, and was then given command of the flagship “Prince George.” Under Digby’s able command, these ships engaged in many battles, and by 1779, he was again promoted. This time, to second-in-command of the Channel Fleet. On 15 June 1779 he received into his company as a midshipman, Prince William Henry, the future William IV, son of George III. On being asked how the ship’s company should address him, the young prince is said to have replied, “I am entered as Prince William Henry but my father’s name is Guelph and therefore if you please you may call me William Guelph, for I am nothing more than a sailor like yourselves.” In December of that year, his fleet sailed with Admiral Rodney to the relief of Gibraltar. At the same approximate time, he was distinguished as Governor of Prince William Henry. In later years, when the Prince left his naval career to become King of England, his excellent record as a Naval Officer was attributed to the training he had received under Admiral Robert Digby. Robert continued his service with the Channel Fleet until 1781, when he was appointed Admiral of the Red and given the command of the American Station, and arrived in Sandy Hook, New York on August 24 to take up his new post. There he found his predecessor, Thomas Graves, about to try for a second time to relieve Cornwallis, and courteously refused to assume to command until Graves’ vain expedition was over. New York, where Admiral Digby took up residence, was in loyalist hands, while New Jersey was a stronghold of the rebels. Prince William, who was staying with Admiral Digby, heard of Colonel Ogden’s plot to seize Admiral Rodney and his royal guest. Washington, who endorsed the plan, stipulated that no harm was to come to the prisoners. Shortly thereafter, the British foiled Ogden’s plan. The British fleet then moved on to the West Indies, where the war with Spain was now concentrated. The rest of the Admiral’s command in America was uneventful in political terms. It was during this time, however, that Admiral Digby met Eleanor Jauncey, the widowed daughter of Andrew Elliott, the lieutenant governor of New York. It must be said that his marriage, at the age of 44, came as a surprise to his family at Sherborne, as his wife was American. Following the surrender of New York, Admiral Digby allied with Sir Guy Carleton, who demanded that Washington honour his promise, allowing the United Empire Loyalists to leave the county “honourably and without molestation.” The pair blatantly informed President Washington that if his promises were not kept, they would resume hostilities without any further warning. The two also stated that they would not wait for formal permission from the London authorities. These two brave commanders saved thousands of Loyalists from a life of misery and possible death which, by all accounts, would have been ruthless. President Washington seemed to have taken the commanders very seriously, and the fleet of ships carrying about 1500 Loyalists headed towards Nova Scotia. They arrived in Conway (later renamed “Digby” in 1787) in early June of 1783, with Admiral Digby commanding the ship Atalanta. As the loyalists in general have requested that you might be appointed to protect them for some time, and as I think too much cannot be done for their assistance, you are to visit the Settlements at Port Roseway and in the Bay of Fundy frequently, and give them such assistance as they may require, and when this Service will admit of it, you are to proceed to Halifax to complete your Provisions…. Mr. Anthony Lancefield and the four undermentioned [sic] Negroes will go with you now, and should any other Pilots apply to you to be admitted to the above Indulgences, you are acquaint me by Letter mentioning where you think they can be properly settled before they are admitted to receive it. You are to give Directions that the Part of the 7th Article of the Provisional Treaty between Great Britain and the United States of America which directs the not carrying away Negroes or other Property of the American Inhabitants be compiled with. You are hereby required and directed to move immediately into the No. River opposite the Burnt Church with His Majesty’s Armed Storeship under your Command and receive on board such Negroes as may be sent to Captain Chads, and as soon as they have been properly inspected, you are immediately to proceed to Port Roseway and land them there, and then return to this Port without loss of time. You are hereby required and directed to receive on board His Majesty’s Arm’d Storeship under your Command all such Negroes as Captain Chads may send, and a soon as they have been property inspected, you are to proceed to Annapolis and St. Johns and land them there, and then return to this Port without loss of time. Memorandum: As I propose sending the Brigg Nancy with the following Articles to Annapolis part for the Loyalists at that Place and part for those at St Johns, you are to take the Management and distribution of them and I should recommend you building a Barrack with a part of the Lumber to take in any of the People that come so late as not to be able to provide for themselves. In order to proceed to Port Mattoon in Nova Scotia, as also ten half Hogsheads of Essence of Malt and six barrels of Sour [Krout], the last two articles as a gift to the Loyalists and Refugees lately settled there, the whole to be distributed under the direction of the Naval Officer that may be in that district. To Mr. John Delafons, Agent Victualler. I beg to recommend to your Excellency’s notice a poor woman whose case I think is really affecting, her husband was a Serjeant[sic] in the Maryland Loyalists and was lost in the Martha. She staid [sic] behind at my request as my cook upon a promise she should be sent to him before I went from hence. She has nothing in the World and no friends in this country. Therefore I beg your Excellency would be pleased to attend to her case, and allow her the lands that would have been allotted to her husband, Serjeant Merril which I think will be bestowed and will very much oblige. As New York is now evacuated, and there does not remain above 3000 Brittish [sic] Troops unprovided with Shipping I think it will not be many days before we shall be able to supply a sufficient quantity for their removal, as we know of a great deal more than sufficient being upon the Sea. I should therefore hope to be able to leave this Port in about 10 days unless Sir Guy Carleton should wish to remain until the of the packet with the definitive Treaty. I have as yet no positive Orders to leave this Place neither from your Lordship or the Admiralty, but as the Lords Commissioners of the Admiralty have acquainted me that Sir Charles Douglas is appointed to the Command and directed me to hold myself in readiness to proceed to England on His Arrival, I shall conclude they cannot mean that I should attempt to go to Hallifax [sic] at this Season of the year, and therefore shall return to England as soon as Sir Guy Carleton and all Troops leave this Place, which I hope will meet your Lordships approbation. I am apprehensive many of the Loyalists are at different Ports will suffer for want of covering. I have therefore directed the Commanding Officers to detain any of the Transports that may be now there for their Preservation, taking care to Keep only such as are absolutely necessary. And what Transports and Victualers [sic] we have in the end more than will be wanted I shall direct to call off Augustine in case that should be to be evacuated. In August 1784 Robert brought Eleanor to his house in Minterne, near Sherborne, which he purchased in 1768 from the Winchester College, to live in retirement after the American War was over. In his diaries, Admiral Digby refers to her as “my little brown wife,” perhaps indicating that she, like him, preferred an outdoor life and was not ashamed to acquire an unfashionable suntan. Robert’s own diaries reveal that he was never happier than when he was working outside, helping with the farming, improving his gardens, making roads, or indulging in his “favourite occupation” of building cascades to dam the stream in the valley. The lakes he created can still be seen in the lovely gardens at Minterne. Minterne was originally the Manor of the Benedictine abbey of Cerne, and after the dissolution of English monasteries in 1539; it was given to Winchester College. The first Sir Winston Churchill rented it from Winchester and left it to his younger son, General Charles Churchill, much to the fury of the Duke of Malborough. Admiral Digby purchased it on a ‘walk-in walk-out’ basis, which meant that all the Churchill furniture, pictures and tapestries came with it. In his diary, Admiral Digby recorded in January 1790 that he had “received a letter from Bishop Inglis of Nova Scotia and the inhabitants of Digby Town acquainting me that they had again altered their plan and that the church was to be built of wood and therefore they cannot claim my donation of £150. He then added, with amusement: “but the Bishop at the same time sending me a draft for the money in case I should choose to give it”. In September 1790 Admiral Digby noted in his diary that he had “received a letter from Lord Digby that Vice Admiral Darby was dead and that his death vacated the B(lue) Admiral of England.” Four years later, he received the coveted promotion to Rear Admiral. Admiral Digby had a practical interest in bridge building. One of the two bridges which he built himself can be seen in the garden at Minterne. Named “Eleanor’s Bridge” after his wife, construction began in 1790 and is a single arch spanning the stream that flows down the valley below the house. The buildings on his estate reflect Robert’s naval career. The great wall of the kitchen is curved and was once complemented by another on the opposite side, so that in plan it resembled the outline of a ship. Admiral Digby also built barns and flower beds to the same design. Eleanor acquired two step-sons with her marriage. Robert Sherbourne and Robert Murray were the offspring of Admiral Digby and an unknown lady. The Admiral, wanting to install the lady as his housekeeper, was advised by his Aunt, Mrs. Cornwallis: “I hear that you have a significant Housekeeper, which will not do. You may keep your mistress in one establishment and have a Housekeeper in your home, but if you combine the two you are forcing the poor girl to be dishonest, for she must allow for the evil day you will cast her off and therefore must cheat you with false bills.” When Eleanor came to Minterne, the oldest son, Robert Sherbourne, was grown and married. He and his wife were accepted as part of the family. Robert Sherbourne was a competent artist and there are some fine pictures by him at Minterne. 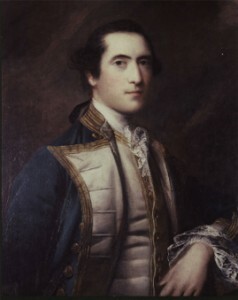 Young Robert Murray followed his father into the Navy and became a captain. Robert appears in the records at Sherbourne Castle as a “sea eleve” (pupil). He was probably born in December 1767 when “the lively Captain Bob returned from Bath for very considerable reasons,” as his brother Stephen reported with amusement. Robert lived in retirement at Minterne and held no further naval appointments. He did, however, retain his links with the New World. Of the six brothers, Robert was to live the longest, passing away on February 25, 1815, aged eighty-three. His Minterne estate passed to William’s son, Henry, who was pursuing a successful career in the Navy and who was to become an Admiral like his uncle. Eleanor outlived her husband by several years and continued the diaries. Admiral Digby’s son, Edward, who became Earl Digby on his father’s death in 1793, died in 1856 without an heir, and the barony passed to Admiral Henry’s son, Edward, who became the ninth Lord Digby. His great-grandson, the twelfth Lord Digby, is Lord Lieutenant of Dorset and the present owner of Minterne. [Geography & History of the County of Digby: author Isaiah W. Wilson mentions (p. 299) …His subsequent visits to Digby in 1794 and 1815 in the Wye, commanded by Sir John Harvey…. Sadly, author Wilson has not sourced this information. It is unlikely he would have made a substantial visit across the “Pond” in 1815. As we know he passed away in February of said year. He would have had to have made the trip earlier that winter.